I am a real believer in delayed gratification. In fact, as much as I love gifts, I love the anticipation even more. 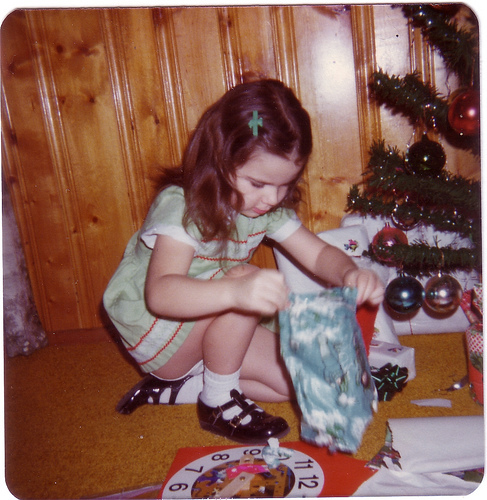 As a child, I gave up the Christmas gift hunt. The annual childhood adventure wasn’t hard in our house, because our home was small and there weren’t many hiding places. But I loved the wait. Daddy always locked the cellar where he spent hours working on new toys and refurbishing old favorites until they were like new. Mother’s hiding job was harder because her sewing machine was in clear view. We usually shopped with her when she bought the material for the mountains of new clothes she would make for us. My last Christmas at home, Mother made me a wonderful new coat. It was red with gusset sleeves and I thought it was the most beautiful coat I’d ever seen. The fact that she made it added to its value for me. I was married two weeks after Christmas that year so she spent added hours that fall working on my wedding dress and my trousseau. I’ve always felt sorry for people who had to have Christmas or to get married without my mother. She made all our clothes, working endless hours sewing and fixing and shopping. That year, she planned the wedding, made my dress and my going-away suit. She made the food for the reception and shopped for the cake. My job was to pick out the bride’s maid dress patterns and materials, design my wedding dress and stand for hours for fittings. After Mother died, I found that the gifts didn’t end. At last I had the money to purchase the garden furniture that I’d been eyeing for about four years. I took a small part of my inheritance and went to the store to buy the chairs, tables and couch. Before I purchased them, I walked out of the store. I knew that an era was over. Thanks to mother’s careful savings, I wouldn’t be searching and saving for the perfect combo for my backyard garden. I would have them. I also knew that Mother’s gifts to me were almost complete. I went to my closet and felt one more time my lace wedding dress, now faded with age. The next day I returned to the store. Over night, the set I wanted had gone on sale. I was able to buy it at a huge savings. I giggled as I purchased my garden set. Mother’s gift giving wasn’t over. When I sat on them perched perfectly under the shade of the gazebo. I cried and laughed and thanked God for a wonderful mother who helped her children understand and cherish the wonder of His love. I silently praised him for a mother who made elegant wedding gowns and who taught me to wait for better gifts and to love sales.